A true adventure to the world's most remote wilderness. This 13-day Antarctica Classic in Depth expedition focuses on the South Shetland Islands and Antarctic Peninsula, home to some of the planet's most impressive wildlife and dramatic landscapes. Throughout the voyage, the team of lecturers and guides will share their knowledge of the region's remarkable natural history. Arrive into Ushuaia, the southernmost city in the world, at any time. Make your own way to the hotel and enjoy the evening at leisure. Today we will embark on the expedition ship. Embarkation time is set for 4:00 pm. The morning is free to do any last minute shopping, an optional excursion to Tierra Del Fuego National Park or a good hike up to the Marshall Glacier. The evening is spent on board the ship watching the sunset over the Beagle Channel. Please note, whilst it is our intention to adhere to the itinerary described below, there is a certain amount of flexibility built into the itinerary and on occasion, it may be necessary or desirable, to make alterations. Our trips are at the mercy of the weather and ice, which is vastly changeable in these parts, but our experienced expedition crew will take advantage of any presented opportunities, to ensure that you have a truly memorable trip. On the first day onboard, your Expedition Leader will give you an expedition overview. Our adventure begins with a 400 mile crossing of the passage that bears the name of the 16th century English explorer Sir Francis Drake. The M Expedition is at home in this part of the Southern Ocean, known for the unimpeded fetch of the winds that encircle the Antarctic. During our second day at Sea, we cross the Antarctic Convergence - a meeting of cold polar water flowing north and warmer equatorial water, moving in the opposite direction. This mixing pushes nutrient rich waters to the surface attracting a variety of seabirds, whales and other species. As we make the passage, you will have time to become acquainted with the ship and frequent the common areas that include the lounge, dining hall, library and lecture hall where we meet our guides, ship's crew and expedition staff. We also begin the lecture and information sessions to learn the extraordinary human and natural history of the Antarctic region. This is what we've all been waiting for - a chance to step foot on the Great White Continent! Over the next few days we will navigate southwards making stops in the South Shetland Islands then through the Bransfield Strait and to the Antarctic Peninsula. Our goal is to attempt two excursions per day, while we navigate through the area, but our itinerary and daily schedule will be based on the local weather and ice conditions that we encounter. The Antarctic Peninsula and the South Shetland Islands abound with wildlife activity. Penguins gather with their fast-growing chicks, whales are seen in great numbers, seals haul out onto ice floes and beaches and numerous albatross and other seabirds trail in our wake. There is plenty of time to enjoy the sheer beauty and the breathtaking scenery of ice-choked waterways, blue and white icebergs, impressive glaciers and rugged snow-capped mountains. The Peninsula also has a remarkable history and during the voyage, we will learn about some of the most important and dramatic expeditions to this remote corner of the world. Keeping a lookout from the Bridge or the deck of the ship, as we thread our way along the continent, you'll feel the same sense of excitement as many of those early Explorers. The continent itself is roughly circular with a spindly arm, called the Antarctic Peninsula, reaching northwards towards Tierra del Fuego. South America is the nearest landmass, some 600 miles away. Antarctica is a continent of superlatives. It is the coldest, windiest, iciest and highest of all the major landmasses in the world. It is the continent with the longest nights and the longest days and it is home to the world's greatest concentration of wildlife. It is also one of the last true wilderness areas left on earth - largely unchanged since the early Explorers and Whalers first landed on its inhospitable shores less than two centuries ago. Heading further along the peninsula, we will travel to shore by Zodiac and visit some of the vast penguin rookeries that can be found here. From a distance, the landscape appears to be dotted with tiny specs of white and black, revealed to be a mass of raucous penguins, once you step ashore. You will enjoy spotting a variety of breeds - Gentoo, Adelie and Chinstrap, all easily identifiable by their markings. You will have plenty of time to walk amongst these curious, aquatic birds - an excellent opportunity for some photography, or simply sit and enjoy the breath taking scenery in front of you. We will attempt to make a Continental landing on our voyage - so get the camera at the ready ! We also hope to visit one of the Scientific research centres, which offers a fantastic insight into 'Life in Antarctica' for people that live there year-round. We continue to soak up this glacial wilderness on our final day exploring the peninsula. Enjoy the serenity of these calm surroundings, miles away from anywhere - only to be experienced by the privileged few. 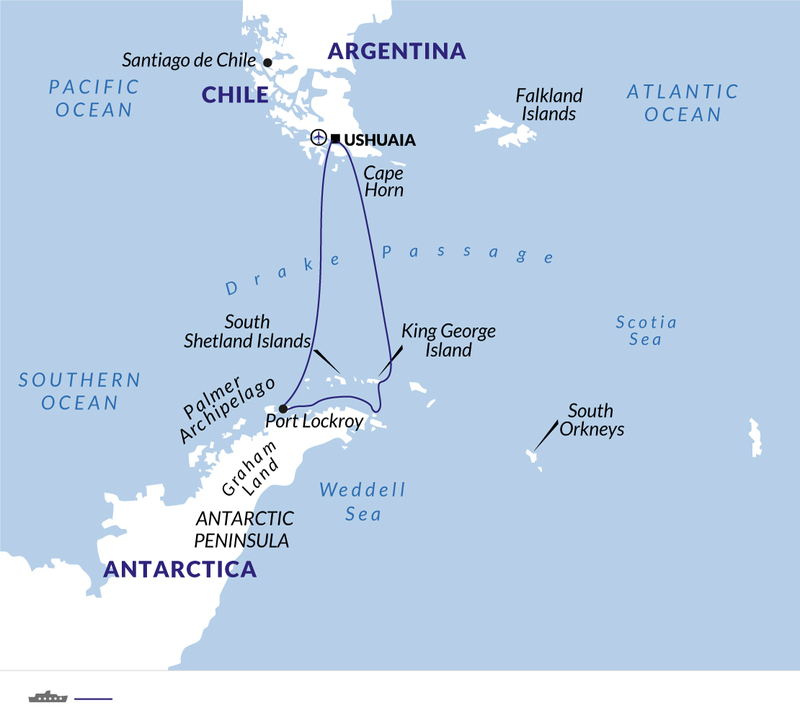 Today we leave Antarctica and head north across the Drake Passage. In between bird watching and whale watching and enjoying some final lectures by our expedition staff, this is a chance to relax and review the adventures of the past week before returning to Ushuaia. And so our adventure comes to a close. We'll say our goodbyes as we disembark in Ushuaia in the morning. You usually have to step from the Zodiac into icy water up to 30 cm high on most landings. Do not bring heavy, cumbersome boots that make it difficult to walk, or boots with metal cleats as they cannot be used for landings. For maximum warmth, wear loose-fitting boots and two pairs of socks. We strongly recommend investing in some good thermal socks, as your feet can get quite cold when sitting in the Zodiacs. Try out your boots before the voyage.